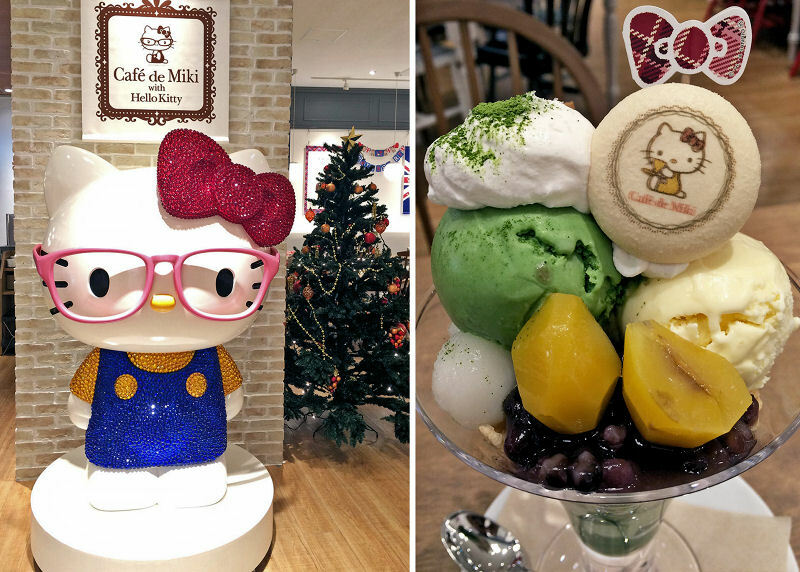 Singapore may be one of the tiniest countries in the world, but it has more than its fair share of cat-themed attractions. 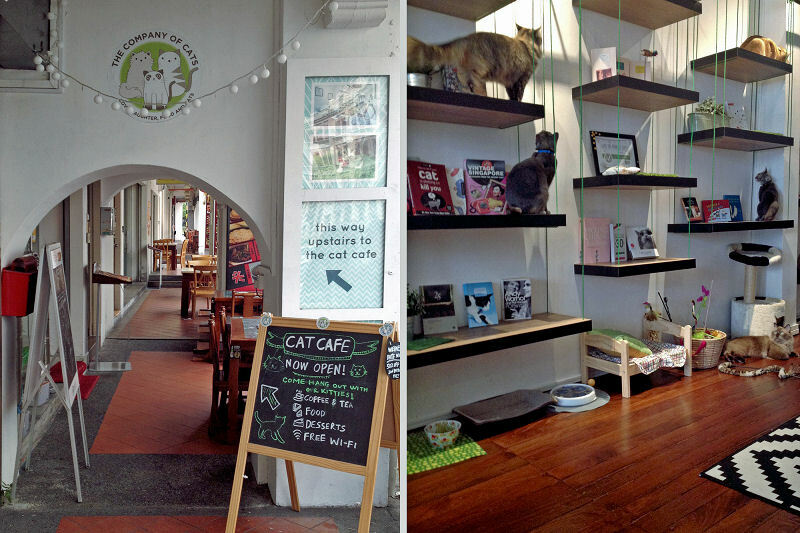 Not only can you find two fully-fledged cat cafes, there’s also a multi-story cat museum. 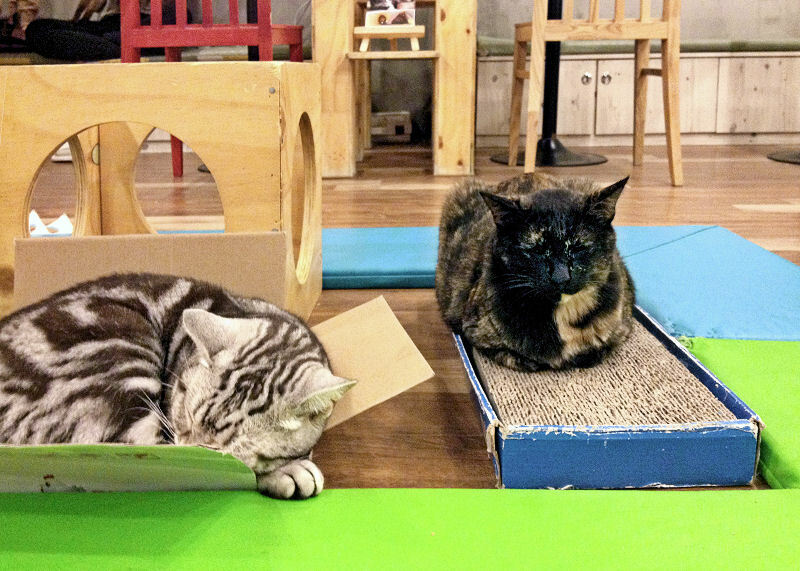 The Company of Cats is one of my favorite cat cafes due to its stylish decor. 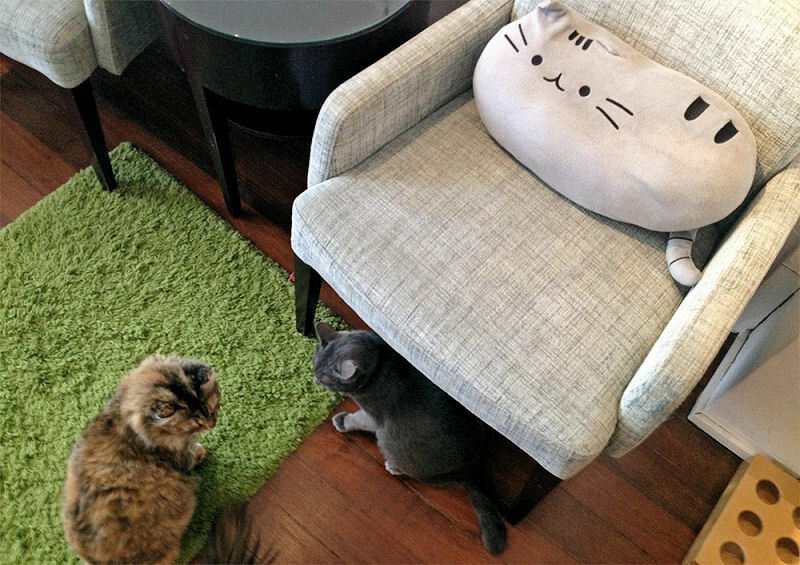 The furnishings are modern and minimalist, featuring adorable Pusheen cushions and a bookcase which doubles as a kitty climbing tree. If the 11 resident cats aren’t enough to keep you entertained, there’s also plenty of cat-themed reading material (featuring such gems as “How to Tell If Your Cat Is Plotting to Kill You”. I’d had my fill of cat snuggles at Cat Village in Taiwan, so when it was time for a cafe stop, I decided to try something a bit different. 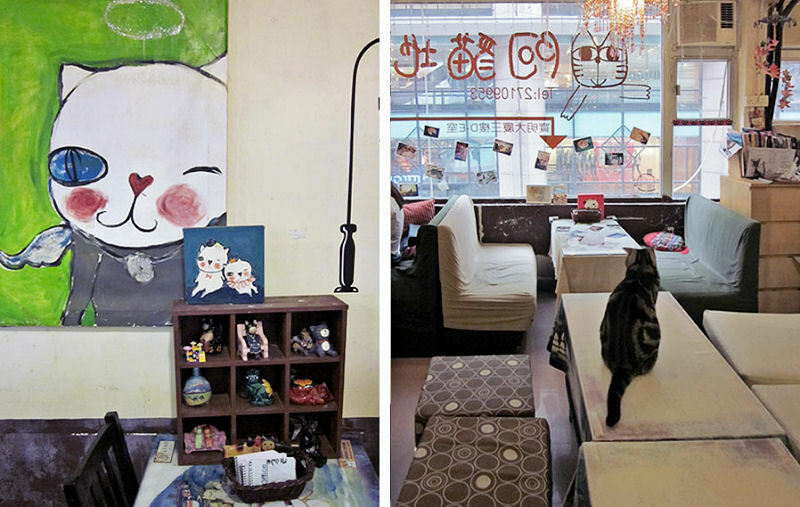 Dayan Cafe is a quaint little spot themed around a cartoon cat called Dayan. Dayan is the star of a comic series called Wachifield. Think of Alice in Wonderland’s Cheshire cat and you’ll come pretty close to Dayan’s personality and his magical world. The cafe itself is small and cosy. 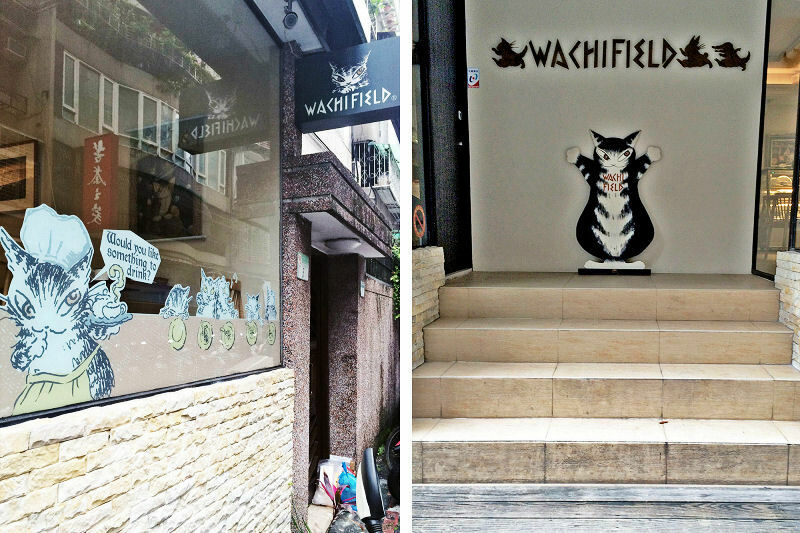 There’s a store attached selling Watchifield t-shirts, keychains and other kitty trinkets. It’s rather hard to order as, at least on the day I visited, there are no english-speaking staff. I ended up picking a little fruit cake with Dayan’s face on the top as it was on display at the counter. 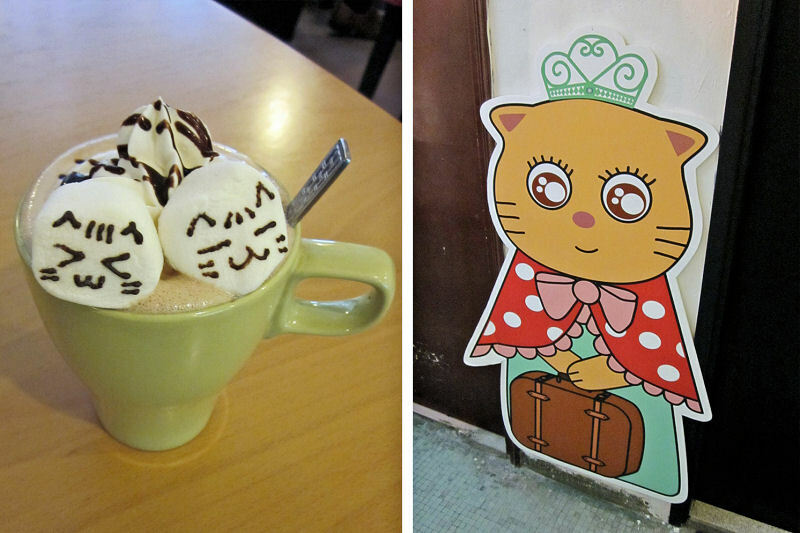 There are also a selection of hot drinks decorated with cat faces. I do hope this comic becomes more popular in english-speaking countries, as it’s a real treat for cat lovers! Hong Kong is one of those cities where most of the excitement is happening above you, rather than at street level. And if you look up into a window in the bustling Causeway Bay district, you might just see a furry friend looking back at you. Ah Meow is nestled in a rather nondescript building, accessible via a small elevator to the third floor. I almost thought I’d made a mistake and wandered into a residential building until I saw all the cute kitty decor around the entrance to the cafe. Most of the felines you’ll find here are purebred, including one curious Scottish Fold. They wander around as if they own the place, so if you don’t like kitty hairs in your coffee, you’ll probably want to give this a miss. Of course, I didn’t mind so I ordered a dessert as well as a drink. 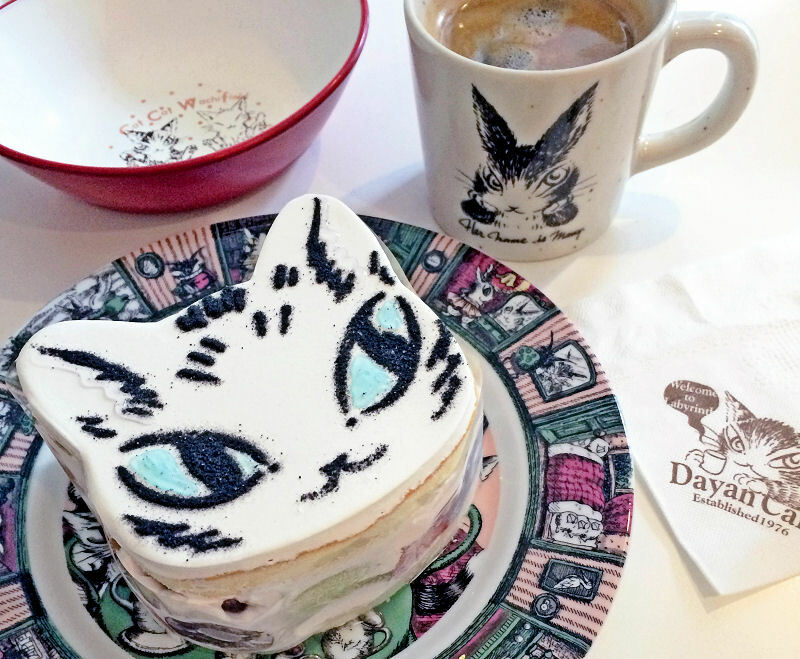 Like, Dayan Cafe, all of the food is decorated with a cat theme. Seoul has got to be up there with Paris when it comes to cafe culture. You can find indie and chain cafes on nearly every street corner, and most have their own unique personality or theme. 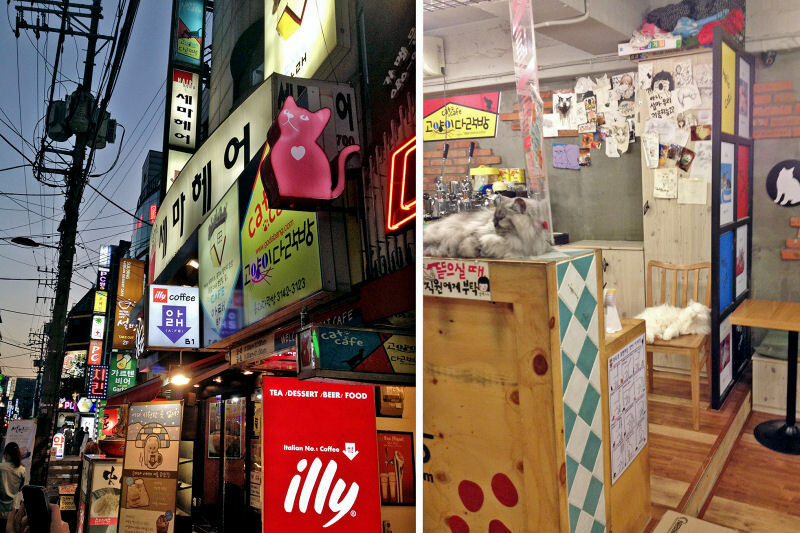 Ideal spots for dating couples or university students needing a break from the stress of their studies, it’s no surprise that cat cafes are have been accepted into youth culture in Seoul. The vibe at Cat’s Attic is somewhere between “New York Loft” and “Sesame Street”. Think exposed brick walls, open space and preschool-esque block colors. Combined with the delicious drink menu (one is included with the entrance charge) it makes a cool place to hang out for a few hours. Like Ah Meow, the cats seem to be mostly purebred. I took a particular liking to the sphynx who took up residence on my lap for almost my entire stay. That said, all of the cats were very friendly, and you could buy treats to entice those who were too lazy to interact. The way to a cat’s heart is surely through his stomach. One can’t visit Japan without encountering the country’s (and possibly the world’s?) most famous celebrity cat – Hello Kitty. 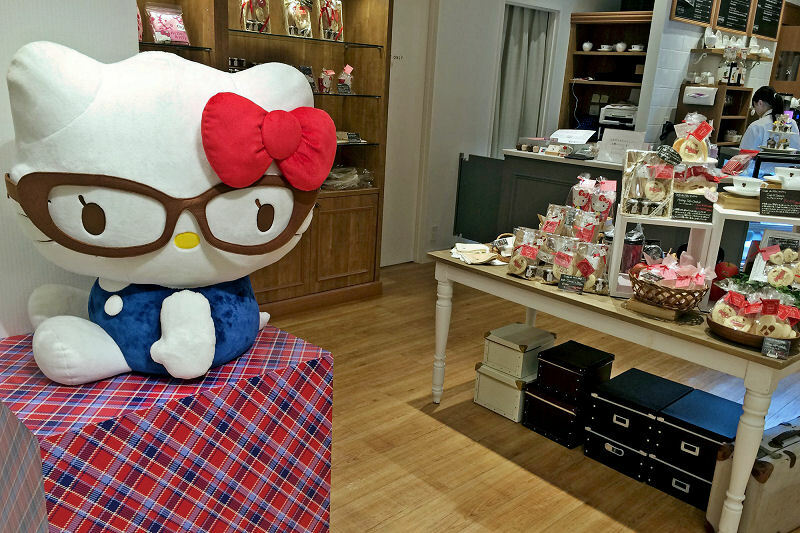 Unsurprisingly, there are a lot of Hello Kitty cafes in Tokyo, but the one I liked most is Cafe de Miki. I found it very strange that this cafe has a British theme because it serves a lot of traditional Japanese inspired desserts. However, Wikipedia tells me that the character herself is supposed to be British! You learn something new every day. However unusual the theme, the cafe is really cute. There’s cat themed decor everywhere. Even the parfait I ordered was topped with a macaron emblazoned with the feline queen herself. Food at these novelty cafes is usually quite bad, but I have no complaints about Cafe de Miki. The green tea ice cream was especially delicious.